August 2, 2010 - Finished capturing the Rock Creek HMA today. Please again refer to the BLM web site for numbers. All horses will be transported to either PVC or Gunnison, Utah tomorrow. Today there is once again false information being circulated on the internet and released to the press. It seems a lady named Katie Fite scouted the Owyhee HMA. I am not sure why she was flying over the gather area during the roundup. We are always concerned about other low flying aircraft when our pilots are in the air. Anyway she took a picture of a dead wild horse up on a ledge on the north side of the Owyhee river. She says it appears that the wild horse had been driven to his or her death over rocky cliffs, presumably by Cattoor. 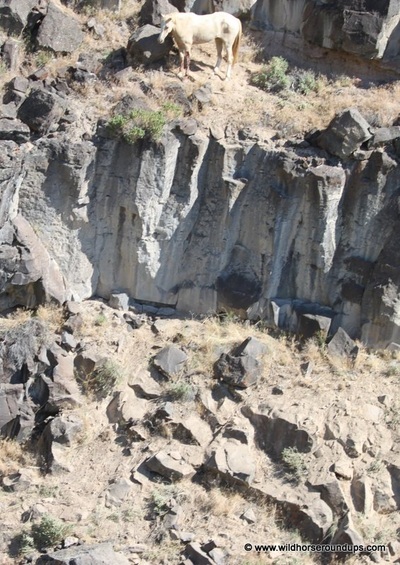 The headlines read “Wild horse was driven over rocks to his death during recent Owyhee roundup. Her assumption is incorrect and the headline is an outright lie. 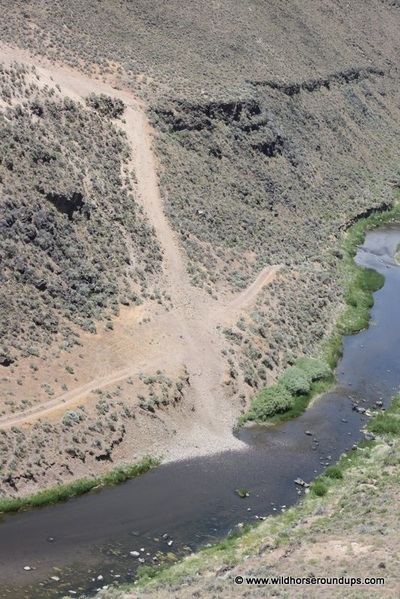 On Sunday July 11 Dave and the pilot flew to the camp they had seen on July 9th that was located just a little ways from the trail that the wild horses use to access the river for water. They went to talk to the campers and let them know that the wild horses were probably hesitant about going to the river to water with them camped so close. Hover over photos for captions. Click for larger views. Wild horse that was euthanized taken just before. One of the reservoirs up on the Star Ridge in the Owyhee HMA. You can see it is almost dry and there is at least one dead horse you can see. This was taken on Sunday the 11th. 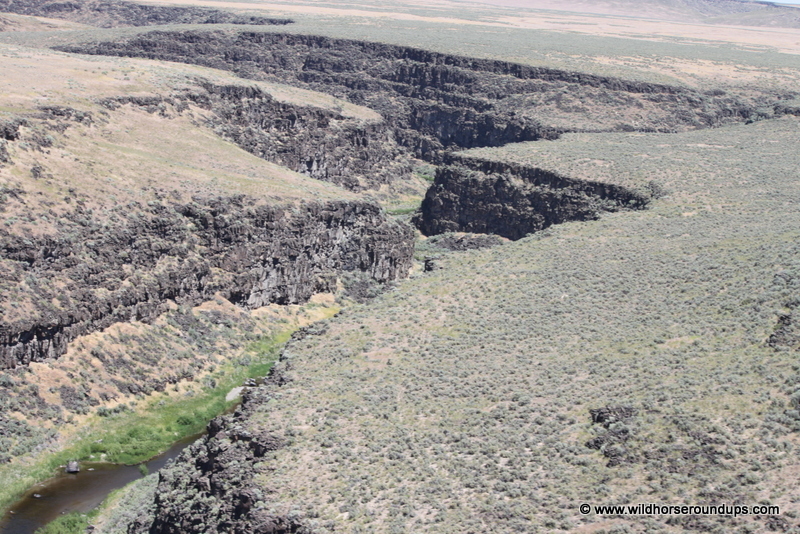 The only access the wild horses use to the Owyhee river - river runs thru kind of a grand canyon. For the Star Ridge horses to get to water once the reservoirs dry up it is very steep. This picture shows the canyon walls and the Owyhee River. Steve bucket-watering a foal in the chute right after capture. The foals were very thirsty and would not have been if they had been able to find water and their moms had plenty of milk Many of the colts looked shaggy, which means they hadn't shed their winter hair. That is unusual for July. Two colts - all were pretty much this good-sized - picture shows how shaggy some were. Shows wild horse drinking the water off the ground when we ran it thru the pens. If horses have never drunk from man-made tanks or troughs before, they are afraid of them and won't drink immediately. When they approached the river they saw a group of wild horses on the north side of the river ledged up in the rocks. This group of wild horses had evidently went down into the canyon to water and then could not find their way back out and had crossed the river and gotten ledged up in the rocks trying to find a way out of the canyon. Dave and the pilot landed and talked to the campers. The campers said the wild horses had been up on the rocks all the while they had been camped there. They thought maybe they had been coming down to water at night but Dave looked for tracks and they had not been doing that. He and Chad got back in the helicopter to herd the wild horses around the rocks and down to the river. The wild horses did not know where to go and were not moving from the helicopter. Chad hovered above as close to the ground as he could and Dave got out of the helicopter above the wild horses and helped herd them over the rocks and down to the river. It was slow going and took both the helicopter and Dave herding from above and behind to get the wild horses to pick their way through the rocks and over the ledges and find their way to the river. All but two made it off to the river. One was this horse that Katie took a picture of and one other was a weanling that had a broken leg and was lodged in a crevice in the rocks. The wild horses were very thirsty when they made it to the river and drank and drank. Chad landed above up on the north canyon rim and Dave made his way back up there. There they waited and watched the wild horses drink and then cross the river and make their way back up the trail and into the Owyhee HMA. Dave and Chad flew back to the temporary holding facility and after consulting with the BLM COR determined there was no way to rescue these injured animals and a decision was made to go back and humanely euthanize them. They did not have a camera with them when they went to talk to the campers but took one when they went to euthanize the wild horses. Here is a picture of the one under the ledge. You can see the injuries on the legs. This horse was also probably very old and was a light colored palomino or almost albino that could hardly see. In this same article there is a statement that says wild horses had been driven down the river bed and held in temporary corrals. No wild horses were ever held in corrals down in the river bed. That is another mistruth. If she is referring to disturbed ground close to the trail into the canyon that would be the camp site of the campers. Ms Fite says she also observed other places where the wild horses have access to water. Yes, there are other places where wild horses could possibly access the river but I am almost certain that if she had checked these other access spots she would not have seen any tracks of wild horses using these trails. I have a picture of one of these places also but the wild horses have not been using this access trail. There are no fresh tracks on it. I am also very disturbed by the statement “the ecosystem was littered with the dead bodies of horses who had suffered heat stroke at the hands of Sue Cattoor, the helicopter contractor.” There were no wild horses that died of heat stroke - that is a lie. 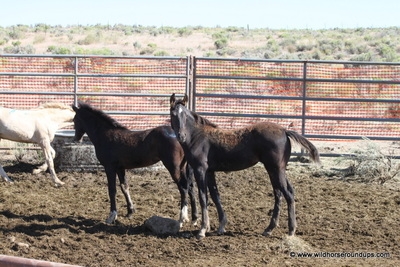 Some of the wild horses captured died of water starvation/dehydration and some died of water intoxication. The pilots also saw some dead horses from the air that had died from water starvation/dehydration or in other words died of thirst. These animals probably died because the roundup was delayed. Ms Fite also describes an area with wild flowers and water flowing out of the rocks, etc. 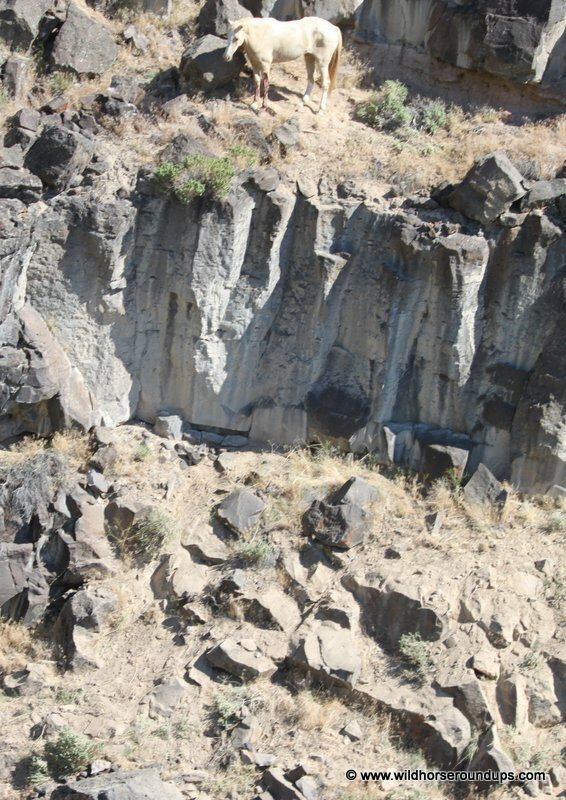 This certainly was not the Star Ridge part of the Owyhee HMA. The Little Humboldt and Rock Creek HMAs have more natural water sources from creeks and springs and there is also a lot of private ground with springs and creeks in these two HMAs. Tuscarora Roundup - July 2010	I have not been able to have access to a computer to do updates on this roundup. But the BLM web site has daily updates with numbers and other information. You can also read all their press releases and information from the court and the vet. Go to	www.blm.gov/nv and scroll down to Tuscarora gather information. The BLM made the decision to start this roundup on the 10th ,even though appeals and etc had been filed and not yet gone to court, because they knew it was necessary to gather on the Star Ridge and Desert pastures of the Owyhee HMA as soon as possible because of the water situation. The gather was originally supposed to start on the 5th. As it turned out 5 days would have made a lot of difference. While the wranglers set up the trap and temporary holding facility on the 9th, Dave flew with Chad to look over these two of the three pastures that make up the Owyhee HMA. When he landed he said the ponds and reservoirs where almost dry and there was a camp on the river within 100 yards of the only trail down into the river for the wild horses. He felt it might be keeping some of the wild horse from going to water. So we knew we needed to start gathering as soon as possible to get the wild horses on water. On Saturday the 10th we started early in the morning and the first group of wild horses came less than ½ mile to the trap. They were sorted and the wet mares and colts put in a separate pen. Part of this group of wild horses were bachelor studs that were mostly young studs. Then Chad herded in a large group of wild horses to the trap where they were sorted and feed and watered. Dave and I stayed until dark hauling water. All horses appeared to be doing good when we left except that we had noticed many that appeared to be gaunt and some of their urine when they peed was dark. - signs of dehydrated animals. The first band we knew had been without water because they were found just off a dried-up seep. When we arrived at daybreak on the 11th we realized just how dehydrated some of the animals were. Immediately Alan and Dave made a decision to not gather anymore wild horses and concentrate on saving all that we could of the ones in the corral. The BLM brought in two water trucks and more water tanks. One started running water down thru the pens on the ground - sometimes wild horses will not immediately drink from tanks - and the other started hauling water up to one of the Star Ridge Reservoirs. The vet treated each horse that appeared to be in distress and we hand watered several colts and some of the young studs. The vet performed necropsies on three of the wild horses. Two of the horses that were dead in the pen that morning showed cause of death was water starvation/dehydration and one that died later showed cause of death to be water intoxication. Our other gather crew was just finishing up a gather in Oregon and planned to go on to Murders Creek and do a roundup there. Instead they came here with extra wranglers, water tanks, and panels for more pens. 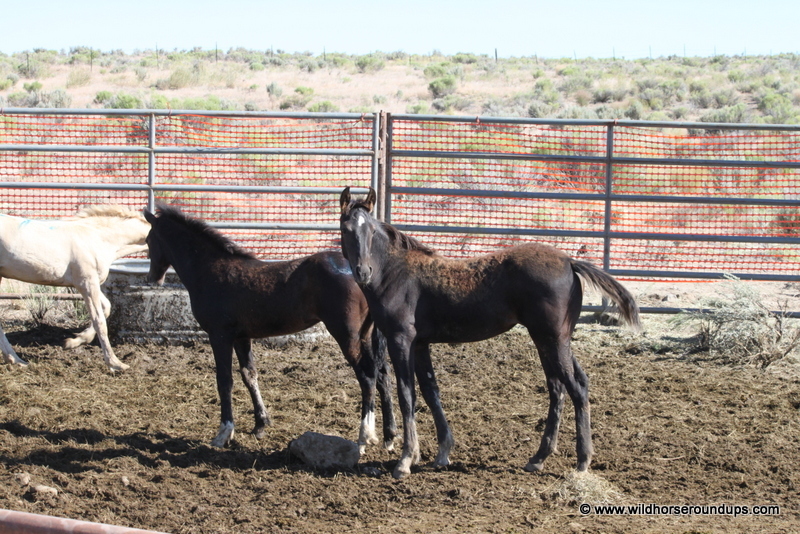 This quick action and joint effort by everyone helped to stabilize and save these wild horses. While we were doing this Dave and Chad again flew and reassessed these two areas. They also landed at the camp on the river and talked to the fishermen. They were fisherman from Idaho and didn’t realize they were causing any problems and packed up and moved out that afternoon.. The wild horses in the Desert Lake pasture have access to the Desert Reservoir but there were only a few tracks going to the Reservoir. When flying Dave and Chad found the ponds and seeps up on top of this pasture almost out of water. too. Water was again hauled both up on top and to the wild horses in the holding facility until dark. The next morning the situation in the holding facility was much better. One of the young studs that we had hand watered had died during the night and two more had not responded to the treatments by the vet nor the hand watering and were euthanized. One older colt that was a leppy when it came in and had a chronic abscessed tooth died later that day. This colt had been separated and hand fed since Saturday. All the other wild horses were eating and drinking and appeared very content. Mares and colts were paired up and doing good. The decision was made to continue to haul water up on top of Star Ridge to try to get as many of the wild horses up there back drinking water at the reservoir. 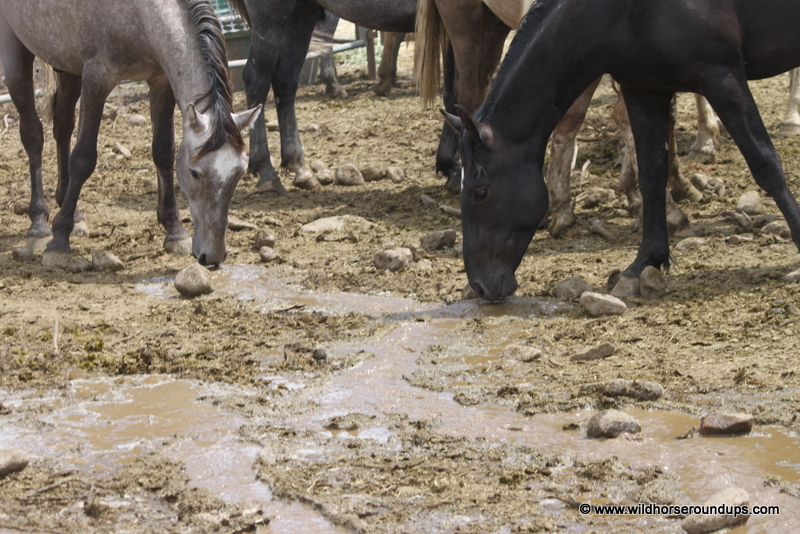 Water tanks had been hauled up to the reservoir and the water was put in the tanks and overflowed into the reservoir so that less would be adsorbed into the ground and more would be available to the wild horses in case they would drink out of the tanks. Dave & Chad also moved one group of wild horses, that had moved to the far side of the pasture looking for water, to the river. This group of wild horses had never been down that trail into the river and the helicopter pilot carefully pushed them down the trail. They were thirsty and immediately drank and drank and then scattered along the bank and did not know how to get back out on that only trail. Again the helicopter was used to bring them back up on top. This group had obviously never been down into the canyon but had always watered at the reservoir up on top. They moved other bands towards the reservoir with the water in it that the BLM was hauling. They also moved some bands in the Desert Lake pasture towards the Desert Reservoir in hopes they would go to that water source. In the meantime gather operations had been suspended and a review committee was being formed to come out and help assess the situation and decide how to proceed. Dave & Chad flew everyday and monitored the wild horses in these two pastures. They found two groups of wild horses on the south end of the Desert Lake pasture that were on two different seeps with very little water left. 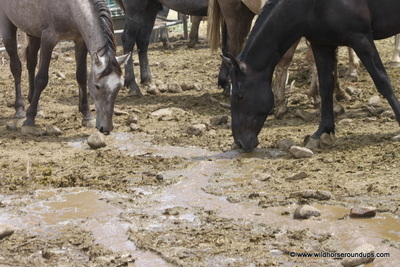 Most wild horses, because they are creatures of habit, will stay on a water source until it is completely gone and end up sucking mud. The more aggressive animals get the water and the others do not. There was access to one of the seeps and the BLM started hauling water to that seep. 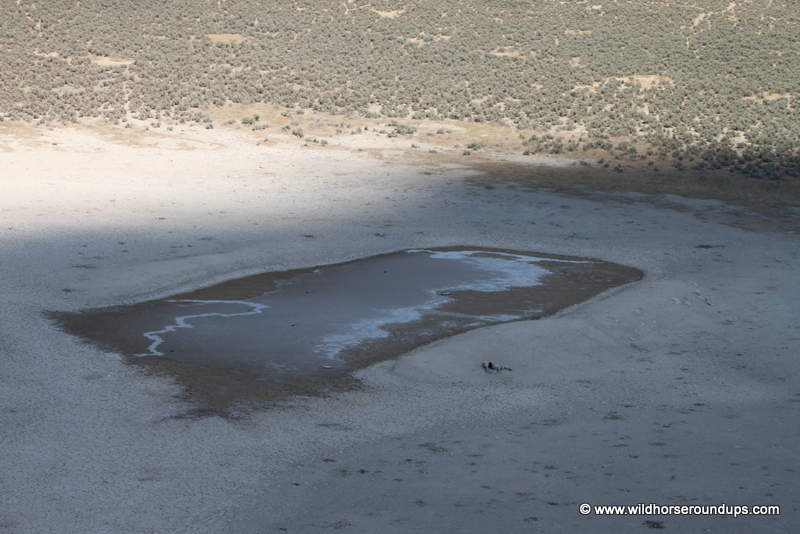 The other band was driven with the helicopter into the adjoining Chimney Pasture and herded towards the south side of the Desert Reservoir which is where the wild horses that live in the Chimney pasture water. We started back gathering on Friday and finished gathering this Owyhee HMA roundup on Monday. You can read the BLM gather reports for additional details. We did capture 22 head of the Desert Lake wild horses at a satellite trap on the south end of that pasture close to the seep where the BLM had hauled water. Not far from this trap the pilot found several wild horses that we did not find in time to save. They were already dead. They would be alive today if we had been able to start this roundup on the 5th. We lost just over 3% of the 638 wild horses captured during this roundup. But if you will look at the mortality log you will see that of the total animals 5 were euthanized for humane reasons, 3 were accidents during sorting, and 13 were from either water starvation/dehydration or water intoxication. The three or less than ½ of a per cent is the number that is gather related. The five or just over ½ of a per cent where euthanized for humane reasons and 2%, or the 13, were deaths from either dehydration or water intoxication. 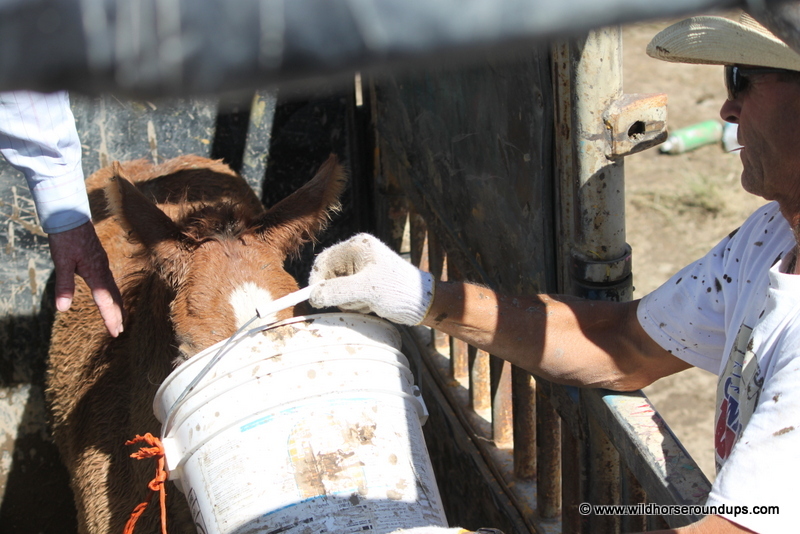 617 animals, including foals were successfully rounded up and taken to the facilities at PVC and Gunnison, Utah. I also need to clear up some things that are being said about this roundup by the press and on the internet. First, the trap and holding facility was not moved onto private ground following the judges decision to lift the closure. The trap and holding facility were put there on the 9th. The wings of the trap were on BLM and the pens for the trap and the holding facility extended on into the private ground. The road access to this site was thru the old Desert Ranch which is private ground. The facility was put here because it was the very best place to capture the wild horses humanely. We had trapped here before and knew it was a place that the wild horses would drift to naturally after the helicopter started them in that direction. We always build our traps and holding facilities were it is best for the wild horses and sometimes it is on BLM and sometimes it is on private. We did not build this facility to keep visitors away. We had to get permission from the ranch to be there and to cross their private ground. Once the closure was lifted, others could have obtained permission from that ranch if they wanted to come there or else access the area on some remote roads located on BLM or by hiking to the area on foot. Second, there are no cattle in this Owyhee HMA.- only wild horses and wildlife. Third, the Desert Reservoir water rights are owned by the ranch and this water was filed on in 1916. This reservoir is not fenced off so the wild horses can get water there. There are lots of places where the wild horses can access the reservoir. The Chimney wild horses all water there and the Desert Lake wild horses can water there but do not naturally go there to water. This reservoir is not connected to the Star Ridge pasture. The only other water available in that pasture is the Owyhee river that runs all along the north boundary. But this river runs thru a canyon that is sort of a miniature grand canyon and there is only one place where to wild horse can go to the river and it is very steep. There are maps on the BLM site so you can see how this HMA is laid out and where that reservoir and the river are.